There are many anime franchises which have seen high levels of popularity in Japan as well as in North America. One such anime franchise received not only one, but two anime adaptations that have since concluded. The franchise I’m speaking of is Fullmetal Alchemist, which received an anime adaptation early in its publication and another adaptation called Brotherhood that not only stayed truer to the source material, but told the entire Fullmetal Alchemist story from beginning to end. However who says that a good franchise has to end once the final chapter/episode is released? Though a few OVAs have been made since the anime ended and will be released soon by FUNimation, another new release is gracing the anime world, a full length movie called Fullmetal Alchemist Brotherhood: The Sacred Star of Milos. Will this side-journey of the Elric brothers be one to remember? We join the Elric brothers shortly after a non-violent criminal has broken out of a prison in an extremely violent manner alchemy that not only destroys half of the prison but wounds countless soldiers. 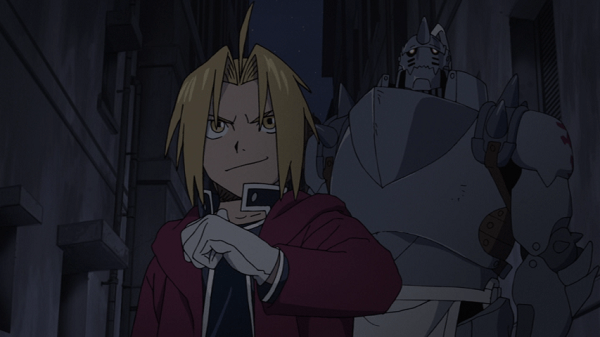 Encountering this escapee Edward and Alphonse Alric realize that this man is no ordinary alchemy user as he uses strange alchemy circles and techniques that neither of them has seen before. This man with unknown abilities manages to escape from them. 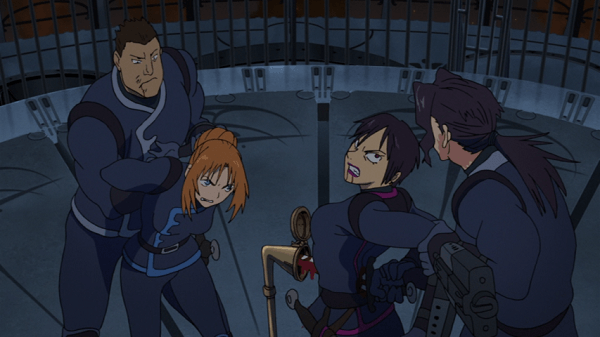 Upon investigation, Roy Mustang and the Elric Brothers discover that the man is heading to Table City, apparently in pursuit of a woman named Julia Chrichton. Soon the brothers find themselves in the middle of a rebellion, attacked by werewolf-like chimera, new enemies and allies and a philosopher’s stone sitting right in the middle of it all. Can the Elric brothers survive and save Julia or will these new enemies be too much for them to handle? Anyone who has paid any attention to Fullmetal Alchemist Brotherhood should know that the anime’s storyline was wrapped up in a nice neat package that left nearly everyone happy. Which brings about the question as to where The Sacred Star of Milos happens to fall in the series’ plotline. The answer to this question is vague at best, as barely anything relatable to the main story occurs; in fact nearly all of the cast of the main show besides Ed and Al have barely any purpose in the show at all. This wouldn’t have been too much of an issue if the characters were never included in the first place, but for an extremely basic reason, Winry is brought in to the show for a few minutes, with Hawkeye and Roy appearing as well. However Roy Mustang, a fan favorite character, barely impacts the story at all and doesn’t even fight on screen as everything he does occurs off screen so the show can focus on the newly introduced Julia Chrichton and the Elric brothers. For what it is worth, the plot of The Sacred Star of Milos is rather enjoyable and features all of the same themes, such as temptation, playing with the power of god and more. To top it off it is also very action packed and anyone who is looking for some fast paced battling will be glad to hear that there is plenty of action here. With the new form of alchemy being used by the main antagonist, we also see a number of new alchemical attacks, including an end-show encounter that bears striking resemblances to a Dragon Ball Z clash where two fighters’ attacks duel against one another. Not only is the plot full of action but also plenty of twists that will catch the viewer off guard and shift the story in a number of ways and keep the viewer guessing as to who is truly right or wrong in this conflict. It is unfortunate however that, despite the movie’s length and content basically covering a well thought out story arc, that nothing in this movie affects the FMA universe in any way as nothing is gained or lost. In fact those unaccustomed to the series who feel like giving the movie a shot will be able to jump into the movie rather easily as many things are explained more than once. This includes what happened to the Elric brothers to make them who they are today and references to how Edward is a State Alchemist. Newcomers to the series will miss out on some small details but each character’s motivations and plans are explained via gratuitous monologuing. 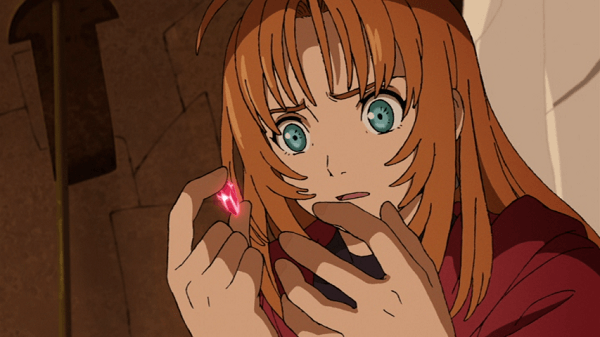 While the anime series for Fullmetal Alchemist usually had a high level of quality artwork, that same quality unfortunately did not successfully transfer into The Sacred Star of Milos. While most of the characters will look decent to start with, the consistency of this artwork varies greatly, with proportion issues and coloring problems appearing too many times to count. This is alarming considering the fact that most movies usually have a much higher budget than their anime counterparts, which begs the question as to why the artwork for the movie is such a blemish on the series. While the artwork of the movie itself has suffered greatly, the animation quality has not. Whenever a battle of any kind ensues the viewer can expect some amazing scenes, both involving the use of alchemy and without, the most notable being a battle on top of a speeding train. 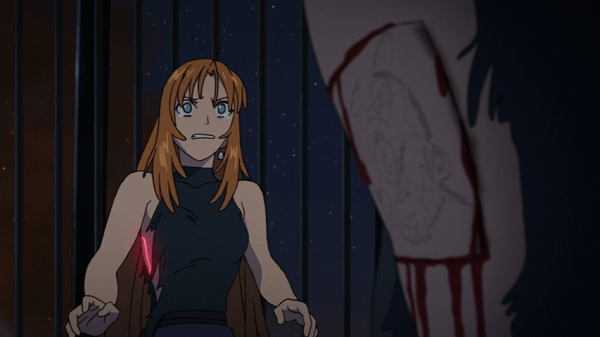 It is strange to see this distinct separation in quality and it is worth noting that, given the fact that this is a FMA movie, the action is also a bit more graphic and violent than the original anime series ever was. Fans of the Fullmetal Alchemist series will be happy to learn that all of their favorite characters have retained their voice actors in both the Japanese and English dubs, with Vic Mignogna handling the voice of Edward Elric and Maxey Whitehead handling Alphonse. With these same voice actors taking the lead we have the same level of quality one would expect from the main Brotherhood series, which was top notch. The newly introduced main character, Julia Chrichton is voiced by Alexis Tipton and she provides a suitable job alongside the other more familiar characters. 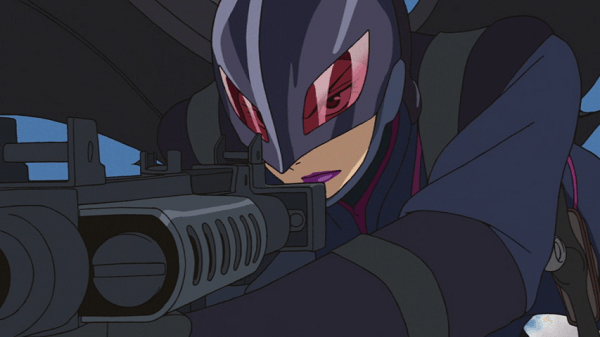 While The Sacred Star of Milos may have an impressive theme song, which is “Good Luck My Way” by L’Arc-en-Ciel, the rest of the movies background music just barely supports what is going on at any given time and will likely be quickly forgotten, such as the opening credit’s song “Chasing Hearts” by miwa. While the movie comes on only one disc, there are in fact two discs included in the release of Fullmetal Alchemist Brotherhood: The Sacred Star of Milos, with the second disc devoted only to extra content. In the first disc we are presented with your standard inclusions of the U.S. trailer for the movie as well as trailers for past and upcoming FUNimation release. The shining star of the first disc’s special features is a full movie-length commentary track that features rotating members of the English voice cast as well as the ADR team. The commentary track itself doesn’t really follow the movie itself, as the voice actors rarely mention what is happening on the screen at any given time but it is still worth listening to as it gives these actors a chance to say their goodbyes to a series they have worked on for quite a while, minus the aforementioned OVA release next month. The second disc containing the rest of the special features contains a slew of miscellaneous content that is all still in Japanese with English subtitles. 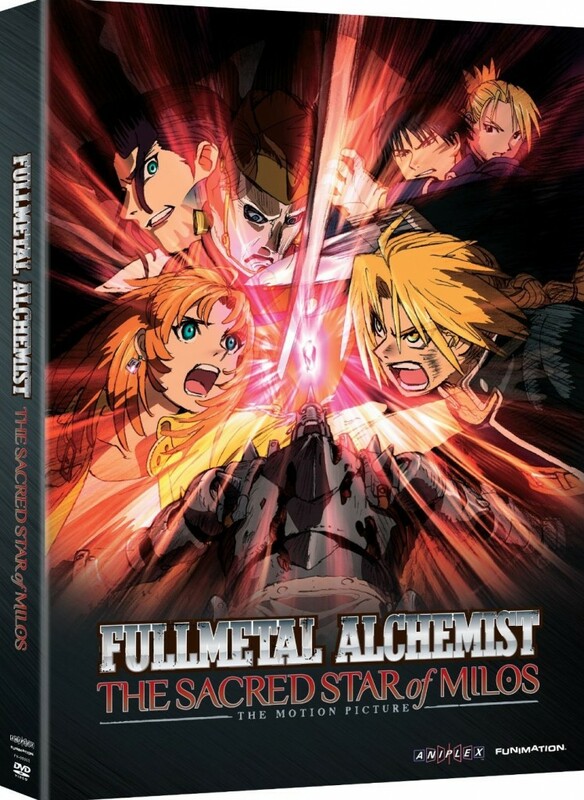 This includes a few TV spots and theatrical trailers, though the two key features on the second disc are the Fullmetal Alchemist: Making of Sacred Star of Milos featurette and a Web Promo. The Web Promo is presented with a very simplistic art style but lasts nearly 20 minutes and is interesting to watch at least once. The “Making of” bonus feature lasts for over an hour and features a behind-the-scenes interview with the production staff that reveals various elements of production and how they created certain parts of the anime. It is worth noting that the subtitles are occasionally difficult to read due to the overlapping of the Japanese captions so certain sections may need to be paused and read to be understood. The Sacred Star of Milos expands the Elric brothers’ journey with what can be best described as an entire story arc combined into one viewing experience. However the quality of the movie’s artwork does not remain consistent nor does it even meet with the standards most long time viewers would have for such a long running series. Despite this, there is plenty of action and a decent story arc to be found in this Fullmetal Alchemist movie, even if it adds practically nothing to the franchise.